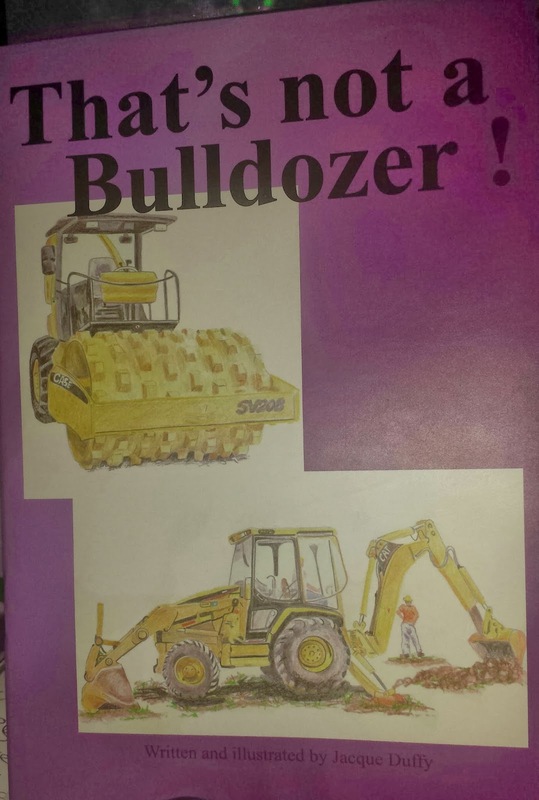 That’s not a Bulldozer! by Jacque Duffy is a story about a little boy and his knowledge of machinery. It is an early reader and part of the ‘That’s not a...’ series. My daughter and myself enjoyed this little reader finding it informative and easy to relate too. Having read other books in this series we would have to say we can highly recommend the series as a set of early readers suitable for both gender. Although there are a couple of titles that can be seen to be aiming at boys we did not find this at all when reading them. In That’s not a Bulldozer! the reader travels a journey with Lachlan who is ten years old. Living in the country Lockie has a very big back yard to play in, often helping dad with the machinery. There is the front end loader for scooping up dirt, the excavator for lifting things, the backhoe which combines both the front end loader and the excavator and the bobcat. Throw in some machinery used to build the roads and you have it all covered. Jacque Duffy has done a wonderful job with the illustrations of this book. They are simple yet capture every bit of detail of each piece of machinery. They add a wonderful visual journey to the experience of reading. For children interested in art the illustrations lend themselves to that of enhancing interest and encouraging creativity.